In the video, the cop said he had a right to follow her to take picture of her plates, because of her threat. She railed at that and asked why he'd follow her to do that. She seemed to understand at that point it might cause her trouble. Fast forward to today. She is still harassing him. I predict we'll see her getting sued in the next week or so and her kid going to her ex-husband, who I'm sure has noticed this whole circus. He won't want his kid with her and he'll go to court to win custody. Her alimony from her ex Doctor husband will be gone and she'll have to move in with her parents or friends, if she has any other than the fair weather Twitter ones. Crash, boom, bang...she dug a hole for herself and covered herself with her own dirt. Just because she can't control her anger. This woman is still cyber stalking the guy by posting all his info in public. Last I checked. Tara was the only one inviting public scrutiny by posting stuff to her social media and Youtube. She will be sued for sure in so many ways. Here's the hit piece she links to from her Twitter account. And more evidence of insulting and slanderous language. So you don't like it when the other side notches up the allegations either? What she's doing could be termed as stalking, attacking, etc. if she's crazy enough to keep doing this stuff on YouTube and Twitter. She's begging for a lawsuit and losing her son. The guy only followed her once to get a snappy of her plates. She's gone on to make herself a reality show and repeatedly is harassing the guy. You know she is in the wrong in all this. She's come unplugged. I only wish her to get the help she needs to deal with life. Yard signs are not that hard to endure. People do it everyday. She needs help and I wish her well. I only hope her family comes to help her before she loses her kid. 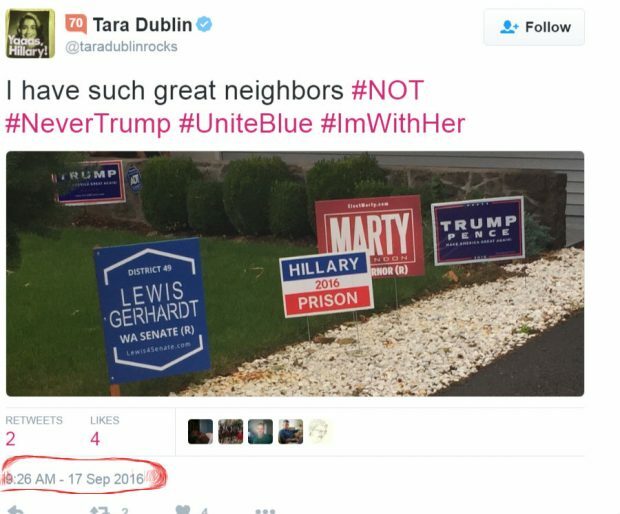 Taking a picture of your political yard signs is not "stalking". Giving someone the finger is not "attacking". Everything beyond these clearly established facts amounts to speculation ricocheting through the hard-right echo chamber, like the article you linked to above. Thankfully, she has been communicating with the police about it consistently, so we can rest assured that if indeed your accusations hold water that justice will be served. Time will tell. Read through this thread for video clips and images of her twitter that were deleted. I haven't sourced the deleted Youtube video mentioned in the article, but there is enough evidence on this thread to convict the gal. So I waded through about 28 pages of invective and found none of the evidence you assert lies therein. The closest thing I found was a picture purporting to demonstrate she was trespassing which turned out not to have been taken by her at all. I really am open to any evidence that supports this narrative that she stalking him, but I think Occam's Razor suggests something much less exciting. She's a prolific social media user who generally likes to draw attention to herself and who evidently has poor impulse control. She acted out and expressed her displeasure in a rather childish way. The owner of the property followed her to confront her. He probably has poor impulse control, too. And frankly, I think someone with a "Hillary for Prison" sign in their yard is likely to be itching for the excitement of a confrontation. It does not take two miles of following a vehicle to get a picture of the license plate. If he had been itching for a face-to-face confrontation with the perpetrator of this insult common sense would suggest he'd not describe his motivations thusly to an officer of the law. Seems she did walk on his property to get that picture. So, she didn't write this hit piece, someone else did? He sounds lovelier than she does. If that's your take away after looking at all the evidence, I'm glad you're not a lawyer. You have a right to your opinion. I only see here going on about this until she gets herself deeper into trouble. And that neither serves her or her child. I only wish she'd get some help as all this rage is unhealthy, as well as playing it out in public like this.